Although we might not think about them often, our gums do a lot. They serve as a seal around our teeth, providing an effective barrier protecting our deeper tissue from bacteria, germs, and disease. However, it’s important to remember that gums are soft tissue. Injuries result from accidental bites, falls, accidents, food and beverages that are too hot, among other causes. Gums may also be punctured by foreign bodies, possibly leading to an infection known as an abscess. Rinse the mouth thoroughly with a mild saltwater solution. If bleeding continues, press a damp piece of gauze against the injury for a few minutes. If you don’t have gauze, use a sanitary napkin or any clean piece of material that will soak up the blood. If the injury is painful, hold ice to the area for five or ten minutes. This will also slow down any bleeding and reduce swelling. If the bleeding doesn’t stop after ten minutes, seek the assistance of a doctor (preferably a dentist or oral surgeon). Keep pressure on the affected area until you receive treatment. If a foreign object becomes lodged in between the teeth and gums, it will likely be painful and could possibly give rise to infection. In addition to certain foods, other objects (like wood splinters from toothpicks or fingernails) have been known to get stuck in the soft tissue area. If you feel an object lodged under the gum, try using dental floss to remove it. A toothpick may also be used to get it free, but be careful not to push the object in further or cause more damage. If unsuccessful, see your dentist. He or she has special tools that will help find and remove the foreign body. They can also provide medication to prevent infection. A periodontal (gum) abscess is a pus-filled sac that forms between your teeth and gums. Abscesses result from infections, some of which are caused by objects that have become trapped beneath the gum line. 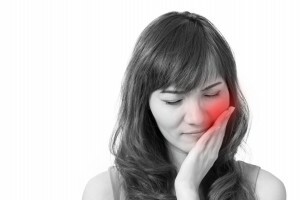 Abscesses are very painful, and may be accompanied by a sudden, throbbing toothache, tenderness and swelling of the gums and face, or even fever. A person who is suffering from a dental abscess needs to see the dentist immediately. If left untreated, the infection can spread to other parts of the body and cause serious problems. Your dentist will determine the location of the abscess and provide necessary treatment. Do you have symptoms of an abscess? Call the Yuba City Dentistry Group today and we will treat the problem immediately.